On vacation from film editing 20 years ago (Final Cut Steenbeck V 3.0), I got myself an Atari ST, started writing, and explored script automation. I built a dream specification for total scriptwriting support. I even sent it to a British company who liked the spec. End of story, except that, in the beginning was the need. If you encountered these products last century you may remember intrusive installation such as a floppy disk "key" with limited installs, or some other harebrained scheme. That's mostly gone with the wind. Today's Final Draft installs on up to two machines at a time (such as a desktop and a laptop), and you activate each during the install, unobtrusively, over the internet, without a web browser needed. De-activate and re-activate anytime, any number of times, with your magic customer number. That's it. It's a win-win for both vendor and user; it reduces piracy and helps keeps the price of Final Draft affordable at $249.00. Its cousin Final Draft A/V for two-column corp-ed-NGO scripting, installs the same way, costs only $149.00. That's discussed below. The automation of script indent formatting and capitalization which makes any such program so valuable remains the core of Final Draft. 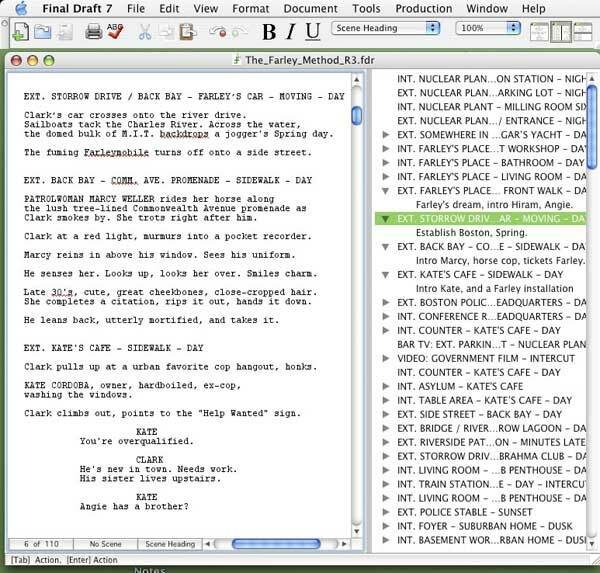 FD has embellished automation with quick-insert character lists, scene lists, annotation, a decent spellchecker you can teach, a thesaurus, and classic index card scene-making features: a complete smart screenwriting system. It is fun to use. Formatting stays out of your creative flow. Revision becomes a joy. Automation means, for instance, the TAB key, a power-user's dream, taking you from Scene slug line, to Action, to Character name, to Parenthetical, to Dialog block -- just by tapping TAB. Automation means, if you reach the bottom of a page and insert a scene slug (INT. MIKE'S OFFICE - DAY) Final Draft will move the slug to the top of the next page to prevent orphans and scene miscounts. It also means SmartType: as you begin to re-type an established scene setting or character name, FD knows it and lays it in ahead of your cursor. It's automagic! If more than one choice begins with "And.." like Andrew, Andrea, Andolini you can choose from the popup smart list. If you use "CONTINUED" or (MORE) at page breaks - not much done anymore except for dialog-- it's all done for you, in the format you desire. The internet is a good place for FD7, because it better supports internet collaboration, a feature called-- wait for it -- CollaboWriter! You can use dial-up connections but broadband (DSL or cable) is recommended,. You can chat with collaborators real-time to work out scene ideas; all participants see it. It's a nice real-time feature for very tight writing teams, for instance those in which each partner takes on the dialog and behavior of certain characters. One of the nicest features is FD's Index Card view, straightforward and fun; summarize on one side, view the scene on the other and "step into " the scene to edit. Re-arrange virtual cards by drag and drop-insert where you like. A Script Navigator feature (illustrated) allows split screen instant double-click access to scenes from a master list auto-assembled from the document, and your Index Card summaries can be disclosed here. Final Draft reports like a powerhouse database program. You can generate Scene, Location, Character reports - the Character reports include the frequency with which your characters interact with others. Lois and Clark not in enough scenes together? You'll know it from the Character report. Too many sets? You see it instantly from the Locations report. It's an eye-opener, and it's better to open your eyes to potential "No's" before The Studio's Reader opens his or hers for script coverage! You get total control over fine tuning in Final Draft; you only get one shot before The Studio's Reader. Reviving the past is easy. I imported a spec script I'd written in a defunct screenplay program two decades ago. I had to boot up my old classic Mac SE/30 to access the program and export it to Word text format. But bringing that file forward into Final Draft 7 in Mac OSX was truly a breeze -- it retained all the indents, only mild cleanup required. I put Final Draft through its paces on a 2001 Quicksilver G4 Dual 800 Power Mac with 1GB RAM, and it's great. Others report sluggish performance with 512MB RAM, under both Mac or Windows. All screenwriting systems benefit from large available RAM, which is cheap, so don't skimp. 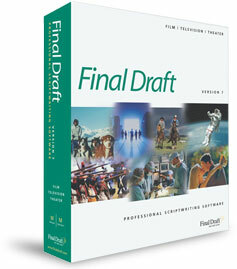 Final Draft A/V is a specialized product built for producers/writers of two-column scripts, popular in TV documentary. I had my colleague, producer David Sternburg -- who uses the format but has never used automated software -- boot up Final Draft A/V for Windows and take it through its paces. 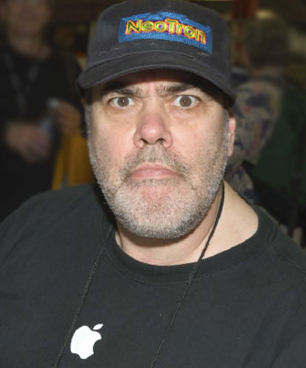 He is impressed with its timesavers, and ability to shift or offset scene and narration text columns against each other; he's encountered no serious glitches on an older laptop and reports saving time doing "stupid picky formatting" he always felt anchored to before. Programs like market champ Final Draft and Final Draft A/V are very cool tools which facilitate screenwriting without getting in your way.